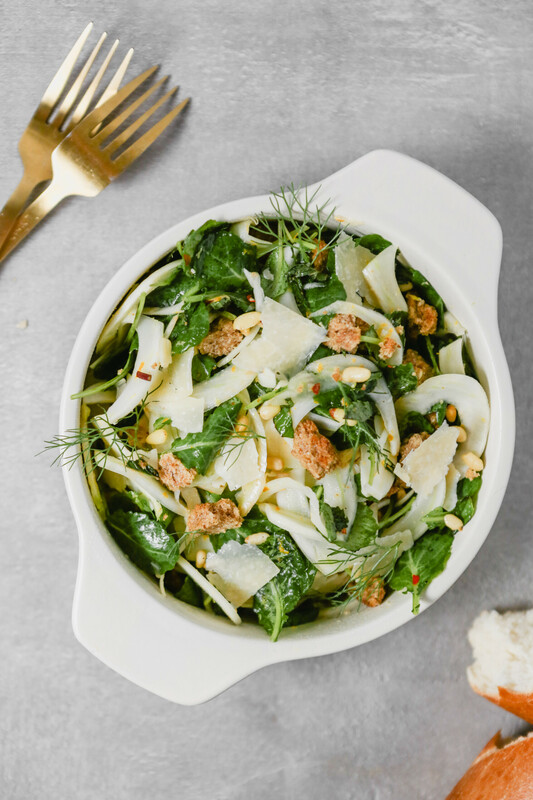 When you need a fresh side dish that’s got more attitude than greens alone, turn to this crunchy shaved fennel salad flavored with orange and fresh mint and studded with homemade croutons, pine nuts and Parmesan. What goes with shaved fennel salad? 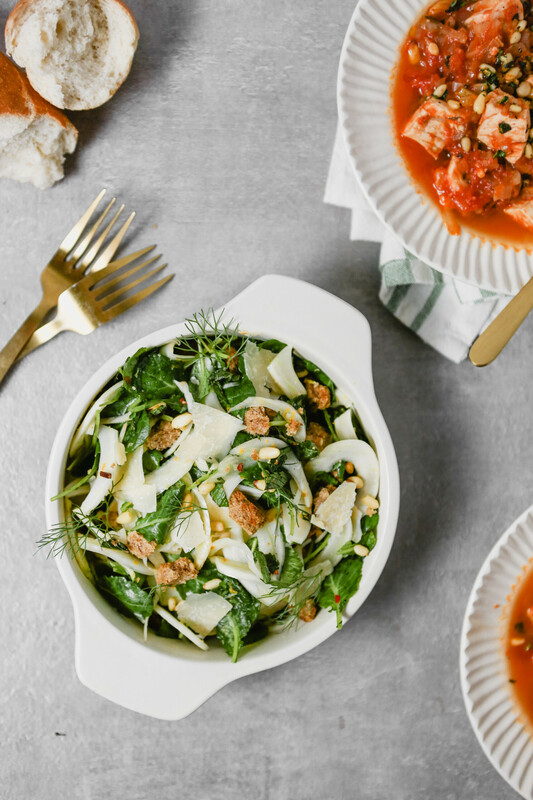 I developed this salad to be served alongside the delicious Sicilian Fish Stew, but it goes well with a variety of fish, seafood and meat. 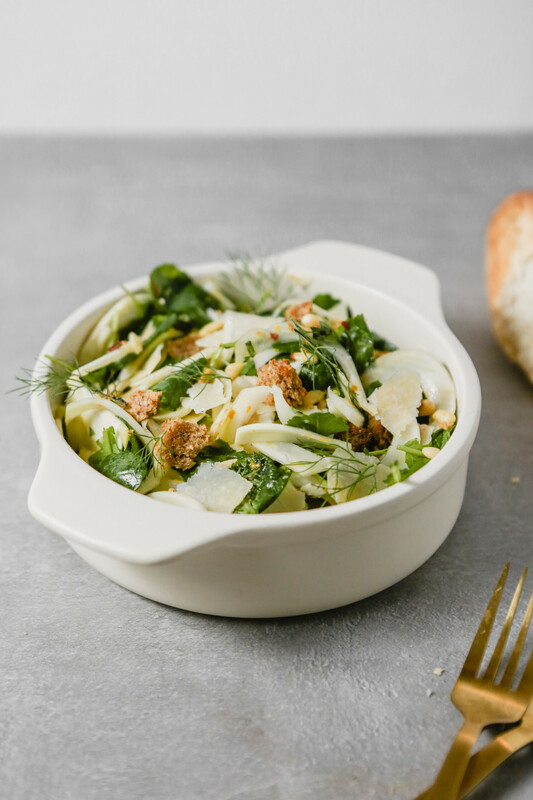 Check out my Christmas Dinner Menu for an idea of what to serve this fennel salad with. 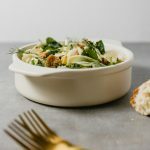 What type of dressing to use for shaved fennel salad? Fennel is fairly bold in flavor which gives it the ability to stand up against other strong flavor players. The type of dressing you choose often depends on what your main dish is. Or maybe this is the main dish, in that case just choose whatever you like. For a slaw-like salad, lightly dress thinly sliced fennel with an herbed buttermilk dressing—creamy and tangy! 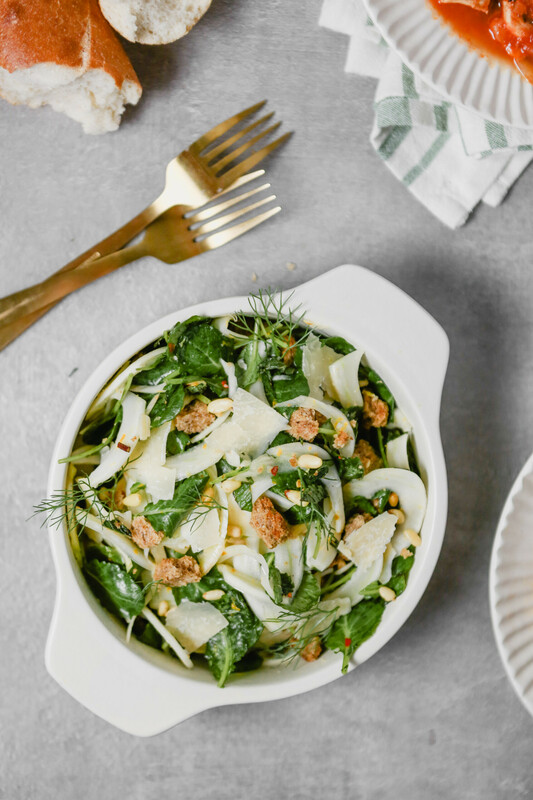 And for a more classic take, toss fennel with a citrus vinaigrette to create a bright, zesty salad that can cut through a savory main dish. 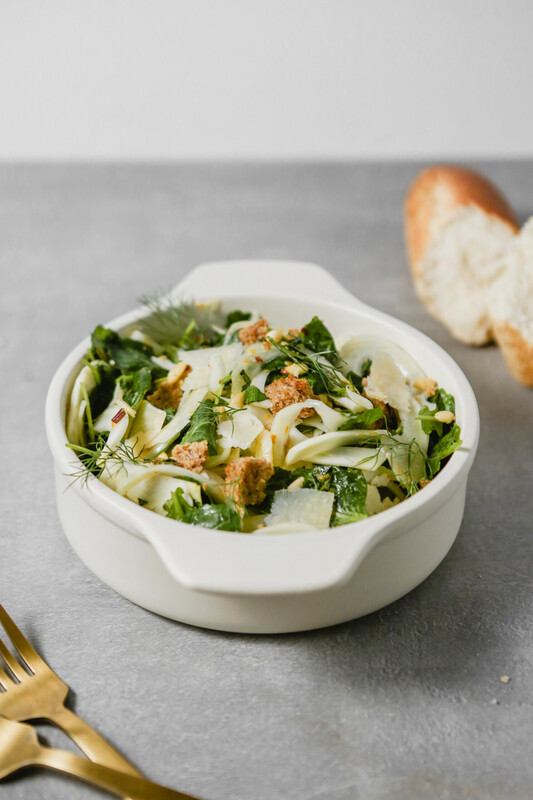 This crunchy fennel salad is flavored with orange and fresh mint and studded with homemade croutons, pine nuts and Parmesan. Heat oven to 400° with rack set in middle position. Whisk together vinegar, garlic, zest, and red pepper flakes in a large bowl. Thinly slice fennel bulbs, about ⅛-inch thick, using a mandoline (or test your knife skills). Add fennel slices to vinegar mixture and toss to combine; season with salt and pepper and let sit at least 15 minutes or up to 1 hour. Toss bread with 2 teaspoons oil on a baking sheet until coated; season with salt and pepper. Bake bread until toasted and golden brown, 8–10 minute. Add toasted bread, remaining tablespoon oil, kale, mint, Parmesan, and pine nuts to fennel and toss to combine. Season salad with salt and pepper and serve.